Samsung has been in the smartwatch game a long time. Things started in a very different place to where they are today, but based on the latest addition - the Galaxy Watch - the journey of ups and downs has been worth it. For the Galaxy Watch, which ditches the Gear S branding to fall more in line with the Galaxy family, is a tantilising Tizen OS watch that's all about the battery life. Does it one-up Android Wear's offerings? Samsung did a fabulous job with the Gear S3 back in 2016. The two models, Classic and Frontier, were without a doubt the best-looking and best-made wearables Samsung had made to date and the Samsung Galaxy Watch continues this legacy. Samsung Galaxy S3 Frontier vs Classic: What's the difference? There are two size options in the Galaxy Watch: 42mm and 46mm. The 46mm model has a silver casing with a 22mm interchangeable strap, while the 42mm comes with a black casing or a rose gold casing and a 20mm interchangeable strap. Whichever you choose, there's a rotating bezel - which turns incredibly smoothly - that fits seamlessly on top of the AMOLED display, while just the two physical buttons sit on the side of the case. A heart-rate monitor is located on the underside. The buttons take a slightly different design path than on the Gear S3, moving away from a crown appearance to a more rectangular finish - similar to those on the S3 Frontier, with a textured rubberised surface for easy detection and a satisfying click when pressed. The laser-marked index on the inside of the bezel adds an element of class and tradition too. Samsung Gear S3 review: Android Wear, beware! Included in the box is a rubberised, ribbed strap. The silver 46mm model and the black 42mm model both come with a black strap, while the rose gold comes with a light pink strap as standard and all are fastened with a body-coloured buckle. The rubberised strap makes the device look a little sportier than some may like, but that's part of its point: the Galaxy Watch is perfectly adept at being worn during sweaty workouts or long running sessions. It never feels like it's slipping, or weighing down your arm. Like its predecessor, the Galaxy Watch looks like a real watch. It has an excellent solid-steel build with some lovely design details that place this smartwatch in the same category as the likes of Fossil and Michael Kors. Yes, it's chunky - perhaps too much for some - but we like it. It's not elegant, per se, nor is it overly smart in the traditional sense - but there's just something about its design and bulkiness that really works. Couple that with its premium quality finish, IP68 water and dust resistance, and its military-grade drop resistance and you have yourself a pretty exciting smartwatch that is worlds apart from the original Gear smartwatches we first saw in 2013. The Galaxy Watch features a Super AMOLED display on both models, which has been a staple choice on Samsung products for years. The 46mm model has a 1.3-inch screen, while the 42mm model has a 1.2-inch display, both of which offer a 360 x 360 pixel resolution - just as the Gear S3 did. And it's a great display. Little has changed in regard to previous generations, but then little needed to change. The screen is colourful, bright and - from arm's length - sharp. More importantly, you can switch it to "Always On" mode which shows the time constantly, even including the ticking second hand, albeit dimmer than when it's fully activated. Despite the positives, there's no getting away from the fact that the graphics don't give the same visual impact as those on the Apple Watch, especially not the newer Series 4 models. That's partly down to the size and shape, but also down to the software. While we've seen both sizes, it's the 46mm model that's on test here. Its greater size means a more capacious battery, which sees it last far longer than the 42mm model. Samsung states that the 46mm model is capable of lasting up to seven days which, given our testing, is unsurprisingly optimistic. With regular daily smartwatch use, the Always On display activated, and a couple of exercise sessions tracked, we found it got between three and four days between charges. Still, with around 25 per cent battery dipping per day, that's really great by most smartwatch standards - so we're very impressed. It can stretch further if you want by deactivating the Always On display, or switching the heart rate monitor off, or deactivating Wi-Fi. But for the most part, we've found that's unnecessary. Charging is just a case of docking on the included wireless charging stand, which is among the most convenient wireless charging methods included with any smartwatch. It's infinitely more stable than the cabled magnetic disc that comes with so many others, be it from Apple or Wear OS manufacturers. Inside, the Exynos 9110 1.15GHz dual-core processor keep things running relatively smoothly. Most of the time we found that on-screen gestures or bezel rotations resulted in smooth and almost instant animations. But things aren't perfect. When notifications come in, there's a noticeable delay between the notification on the phone (or vibration on wrist) and the actual notification appearing on the screen. Sometimes by a couple of seconds. In terms of fitness, the Galaxy Watch will recognise six activities automatically: walking, running, cycling, elliptical, rowing and dynamic workout. But there are around 40 other exercises that can be started manually too. As you might expect, all the data syncs with Samsung Health. The Galaxy Watch will also track your sleep, creating a log including four stages of sleep. It can also monitor stress levels and provide guided breathing, all of which fitness trackers like the Fitbit Charge 2 offer too. What's interesting in the Samsung is these fitness features are built into a capable and fully-featured smartwatch, so you're not having to make the choice between a good fitness tracker or a good smartwatch. It's everything in one. We tested it on a number of runs alongside the Garmin Fenix 5 Plus - one of the best sports-centric smart connected watches currently available, we might add - and after some inconsistencies on the first couple of runs the Galaxy was tracking pretty much the same as the Garmin. Distance, pace and heart rate were all within acceptable margins. One of the great things about Samsung Health is that it covers all the important metrics you'd want it to - without going into Garmin-level nitty-gritty elements. That means on your runs you can view your pace, distance, cadence, heart rate and elevation, as well as a map of your route (on the Android/iOS app, and on the screen of the watch itself). You even get a breakdown of your heart-rate zones, showing how much time you spent in the "maximum" or "vigorous" zones to help you see how hard you're working. In terms of other features, the Galaxy Watch is compatible with various apps including Spotify and Uber, allowing you to listen to your favourite playlists with wireless headphones and order an Uber from your wrist. Samsung Pay is also on board, allowing you to pay for items up to £30 with your watch - even if you don't have your wallet with you. The downside with Samsung Pay? Not all the banks support it yet. In fact, a lot of the big names aren't on the list in the UK. There's no Barclays, Lloyds, Halifax, TSB or RBS, so it's some way behind Apple Pay in terms of adoption. And we're not sure if that's going to improve drastically any time soon. What is Samsung Pay, how does it work and which banks support it? 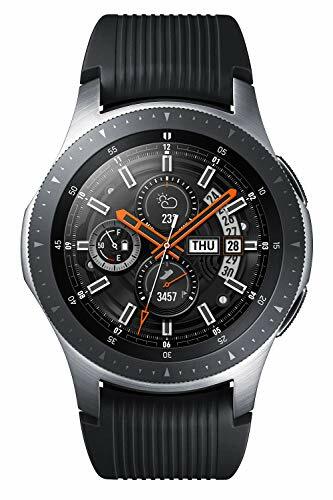 Although Samsung's watch uses Tizen OS, and not Wear OS, the Galaxy Watch is fully compatible with pretty much any phone. You can pair it with an Android smartphone (after downloading the Gear app, plugins and Samsung Health app from the Play Store), or even pair it with an iPhone if you want. The main difference between the Android and iOS experience is that Apple limits the amount of interaction you can have with notifications. With Android, some apps will let you use one of many preset quick reply options, or even reply with a dictated response, whereas the iPhone will only push notifications to the screen. We tested the Galaxy Watch with the Galaxy Note 9 and a OnePlus 6, and found the experience between the two devices was largely the same. Notifications pop-up on the screen, compatible apps let you reply. With phone calls you can even accept the call on the watch and use its built-in speaker and microphone. Now, while Tizen's user interface hasn't changed much in recent times, there's still a lot to like. It's simple to use and, although graphics might not be as immersive or impressive as the Apple Watch, it's simple and intuitive. The watch faces, likewise, aren't overly complicated but are customisable: there's the option to change colours and complications on a lot of the watch faces that are pre-installed. The only disadvantage to Tizen, compared to Wear OS or Apple's WatchOS, is the app support. Since apps have to be installed through the Galaxy app store, there aren't that many of them. You get Uber and Spotify, as well as a handful of Under Armour apps (MyFitnessPal, Map My Run, UA Record, Endomondo and Own the Day), but that's pretty much it in terms of well-known third party options. There's no Strava, which might be a deal-breaker to community users, since the available tie-in that lets you share data between Samsung Health and Strava is unreliable. The Samsung Galaxy Watch continues the tradition set by its predecessors: it's a well-made, easy to use, durable and attractive smartwatch. While it's improved in the battery department - its four days per charge (46mm model only) is mighty impressve - it's still lacking in some of functionality that you'd hope to see from a smart wearable device in 2018. And its apps aren't aplenty by any stretch of the imagination. In many ways, however, Samsung's premier smartwatch is one of the few strong competitors to the Apple Watch. It's as smart a watch as it is a sports watch, meaning chunky style and adept fitness tracking rolled into the one package. The last smartwatch from Samsung featuring the Gear brand, but with a lot going for it. If you're not massively fond of the completely round Galaxy Watch face, or just want something a bit more sporty looking, the Gear Sport has a lot of the same functionality as the newest watch. The Apple Watch is a very capable smartwatch for iPhone users. In fact, those in the iOS ecosystem shouldn't consider anything other than an Apple Watch (unless they want an in-depth sports tracker, in which case a Garmin is more suitable) as the company's ecosystem grip is so tight that anything outside is a little limited in functionality.